Earlier this week, I had explored the Cathedral of Saint John the Baptist in Perpignan. 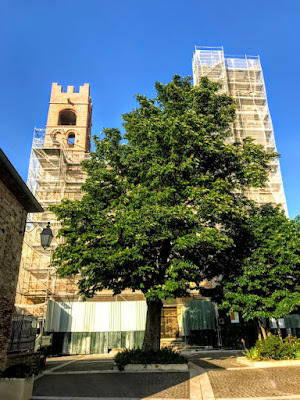 But this was not the first cathedral of the diocese, and so on Thursday evening [17 May 2018], after an afternoon by the sea at Collioure, three of us made our way up through the hills and narrow streets of Elne to visit the Cathedral of Sainte-Eulalie-et-Sainte-Julie. 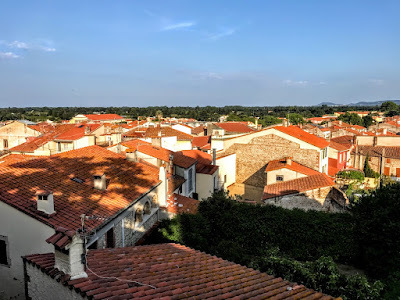 From its lofty, fortified site, Elne (Elna) dominates the narrow plain of Roussillon between the Pyrenees and the Mediterranean. This was the first capital of the former province of Roussillon, before the provincial capital was moved to Perpignan. 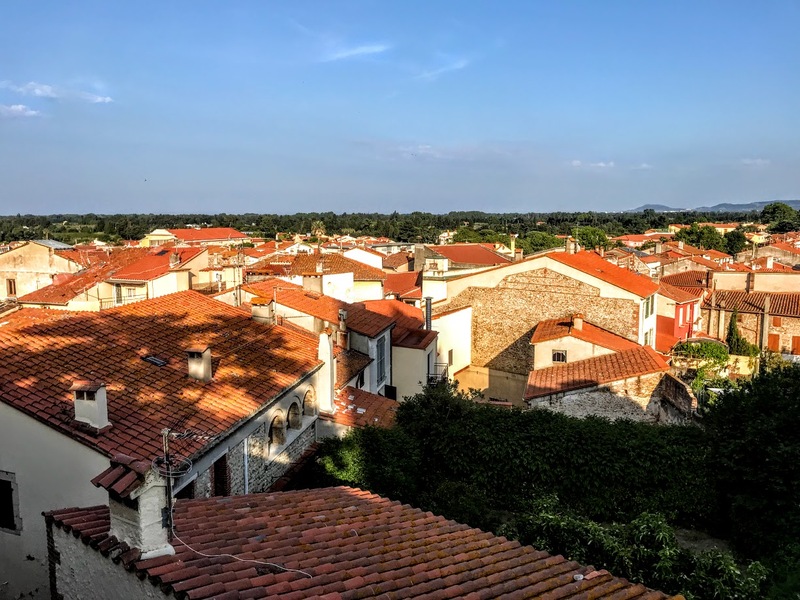 Elne is the oldest town in Roussillon and successive civilisations have left their traces here. Numerous archaeological researches have shown that the surrounding countryside has been occupied since Neolithic times. As Illiberis, the place is first mentioned in the history of Livy. This is the Iberian city where Hannibal pitched camp after he crossed the Pyrenees in 218 BC, and here he negotiated his safe passage through Gaul on the way to Italy. In the fourth century, Illiberis became Castrum Helenae, named after Saint Helen, the mother of the Emperor Constantine. Constans, the son of Constantine, was assassinated within the walls of the city in 350 AD. When southern Gaul was divided in 462, Elne became one of the ‘seven cities’ of Septimania. A bishopric was established in the city in the sixth century, and the first-known Bishop of Elne, Dominus, is mentioned in 571 in the Chronicle of John of Biclarum. The Bishop of Elne attended the Council of Toledo in 599, and the bishops of Elne called many synods. When the Arabs crossed the Pyrenees in 719, Elne was one of the first towns they attacked. When the Counts of Roussillon achieved independence, Perpignan became the capital of the county, but Elne remaining the Episcopal city. The present cathedral of Sainte-Eulalie-et-Sainte-Julie was built later in the 11th century and the high altar was consecrated in 1069. The Romanesque cloister was built in the 12th to 14th centuries. The cathedral and the cloister are rich examples of elaborate mediaeval ornamentation. During the Aragonese Crusade instigated by Pope Martin IV, Elne was plundered in 1285, the cathedral was set fire and the people of the town who had taken refuge inside the cathedral were massacred by the French troops of Philip III. During the later Middle Ages, Elne was increasingly overshadowed by the growing prosperity of nearby Perpignan. The Counts of Roussillon moved their seat from Elne to Perpignan. The people of Elne revolted against French rule in 1472. The town was besieged yet again, was conquered and the leader of the revolt, Bernat d’Oms, was beheaded in 1474. Elne and the rest of Roussillon were returned to the Kingdom of Aragon in 1493. Later Bishops of Elne included members of the Sforza and Borgia families, including Cardinal Ascanio Maria Sforza (1494-1495), Cardinal Caesar Borgia (1495-1498), and Cardinal Francisco Lloris y de Borja (1499-1506). After becoming Bishop of Elne in 1495, Caesar Borgia decided to raise the taxes on the clergy, resulting in an uprising in 1497. After the clergy complained to the king, these taxes were halved the following year. The episcopal seat was transferred to Perpignan finally in 1601 under a Papal Bull issued by Pope Clement VIII. Elne came under siege from the French again in 1641, and after the Treaty of the Pyrenees in 1659 it was formally ceded to France. The mediaeval ramparts were partly destroyed in 1680 on the orders of Louis XIV. The artist Etienne Terrus and the sculptor Aristide Maillol lived in Elne in the 20th century and the studio of Terrus, which was visited by Henri Matisse and André Derain while they were painting in Collioure, and Terrus is associated with the birth of the Fauve movement. Elne is now agricultural town but it also attracts about 70,000 visitors each year. Collioure is half an hour south of Sainte-Marie-la-Mer, where I am staying this week, and another half an hour from Perpignan too, and another 30 minutes would bring us across the border at the Pyrénées and into Spain. 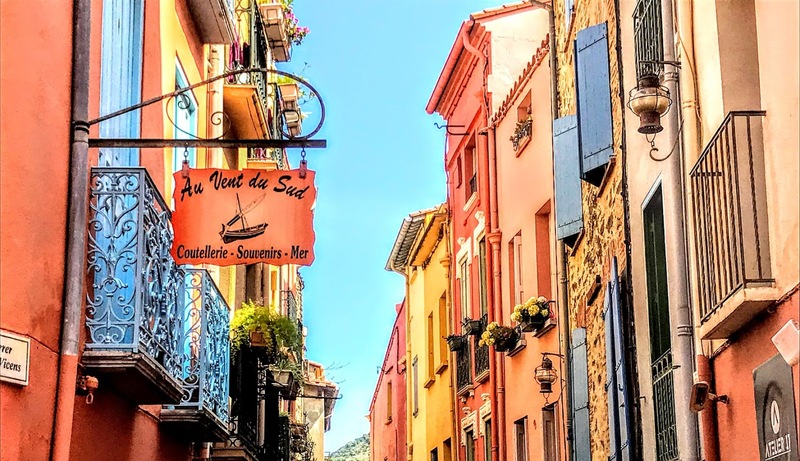 The town of Collioure (or Cotlliure in Catalan) is on the Côte Vermeille, and with its typical Mediterranean bay, Collioure attracted several Fauvist artists who made it their centre in the early 20th century. André Derain, Georges Braque, Othon Friesz, Henri Matisse, Pablo Picasso, Charles Rennie Mackintosh, James Dickson Innes and Tsuguharu Fujita have all been inspired by the colours of Collioure, its royal castle, mediaeval streets, and the lighthouse converted into the church of Notre-Dame-des-Anges. Ninety-eight reproductions of works by Matisse and Derain are exhibited around the port and harbour in the very same place where they painted the originals in the early 20th century. The Spanish poet Antonio Machado, who fled to Collioure at the end of the Spanish Civil War in 1939, is buried in the cemetery. The British novelist Patrick O’Brian lived in Collioure from 1949 until he died in 2000. 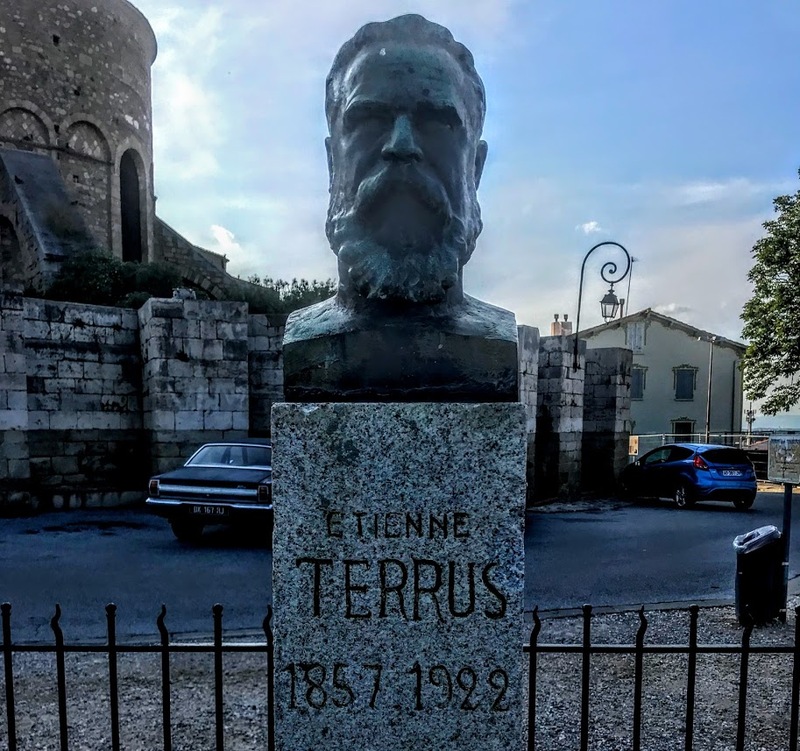 His novel The Catalans graphically describes life in Collioure before major modern changes, and he also wrote a biography of Picasso. 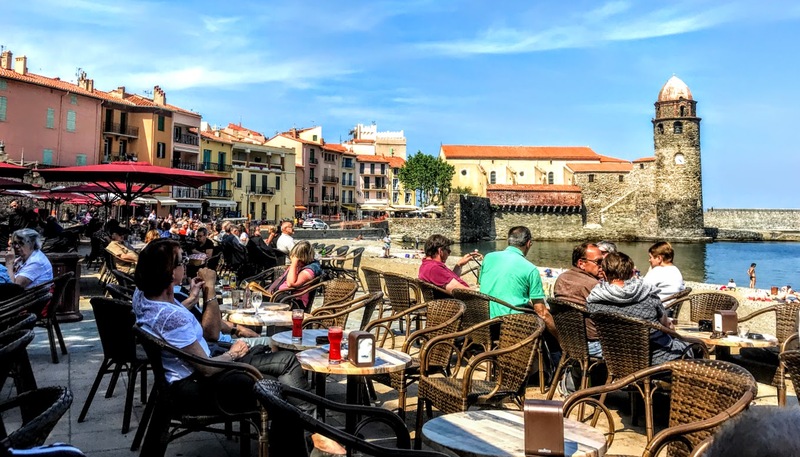 At one time, Collioure was separated into two villages by the river Douy: the old town to the south named Port d’Avall or Le Faubourg, and the up-river port, known as Port d’Amunt, or La Ville. The Château Royal de Collioure (or Castell Reial de Cotlliure) is a massive castle that dominates the centre of the harbour. The castle at Castrum Caucoliberi is known from as early as 673, indicating a town here had strategic and commercial importance, when the Visigoth leader, Kingg Wamba, laid to the castle to subdue a rebellion. Girard II, the last independent Count of the Roussillon, bequeathed his land to Alfonso II, King of Aragon and Count of Barcelona, in the 12th century. The Kings of Aragon, anxious to promote the prosperity of Collioure, granted the place privileges and tax exemptions. The Knights Templar built the castle around 1207 and integrated it to the royal castle in 1345. A second castle was later built by the Kings of Majorca in the 13th and 14th centuries. In the 13th century, the castle was annexed to the Kingdom of Majorca, which included the domain of Montpellier, the counties of the Roussillon and Cerdanya, the Conflent and Vallespir, and the Balearic Islands. 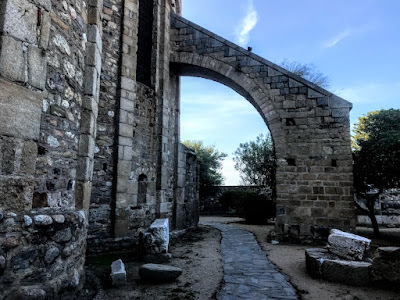 The Kings of Majorca travelled with their court, moving often from Maguelonne, near Montpellier, to Perpignan, to Palma de Majorca or to Collioure. In the 16th century, after a brief occupation by Louis XI, the Spanish Habsburgs again occupied Collioure. Charles V and his son Philip II turned the castle into a modern, 16th century fortress and reinforced the castle defences and its surroundings. 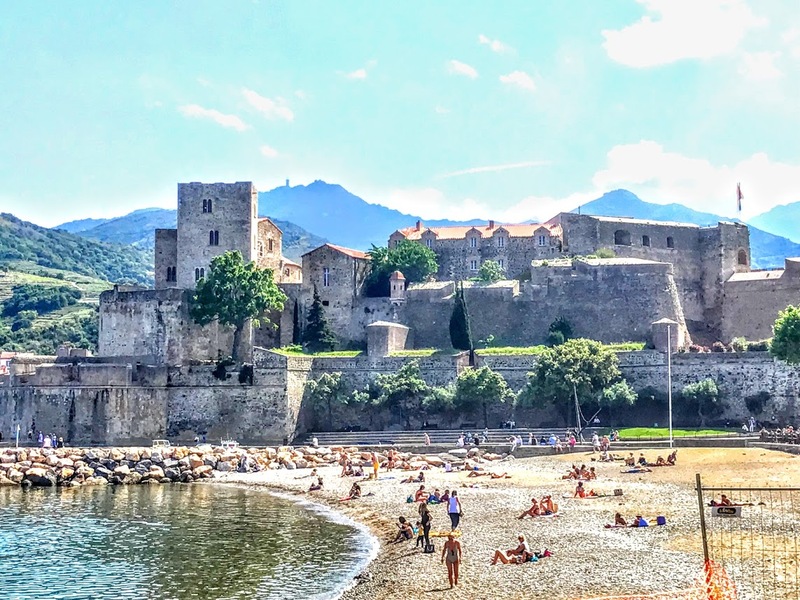 During the wars between the Spanish Habsburgs and the French Bourbons in the 17th century, Louis XIII’s troops laid siege to Collioure and the Château Royal in 1642. A French force of 10,000, including Turenne, d’Artagnan and the King’s musketeers, occupied the hills overlooking the town, while the French fleet blocked the port, the Spanish were forced to surrender, and Collioure was captured by the French under Maréchal de la Meilleraye. A decade later, the town and the castle were ceded officially to France under the Treaty of the Pyrenees in 1659. 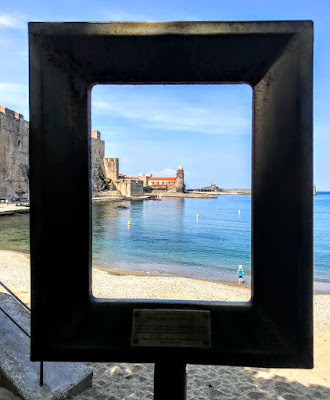 Because of the town’s strategic importance, the Château Royal de Collioure and the Fort Saint-Elme were strengthened by Louis XIV’s military engineer, Sébastien Le Prestre de Vauban (1633-1707), who also built new fortifications at the Palace of the Kings of Majorca in Perpignan. Collioure was besieged and captured by Spanish troops under General Dugommier in 1793-1794 in the last attempt by Spain to retake the city. The castle had lost all strategic importance by the beginning of the 20th century, and was offered for sale at auction. It was turned into a men’s prison in 1939 and became the first camp in France holding refugees from the Spanish Civil War. The castle now belongs to the local government and is one of the major tourist attractions in this region. Collioure is overcrowded by tourists in the summer. But it was relaxed yesterday afternoon as three us strolled through the colourful narrow streets of Moré, the old fishermen’s neighbourhood by the harbour. 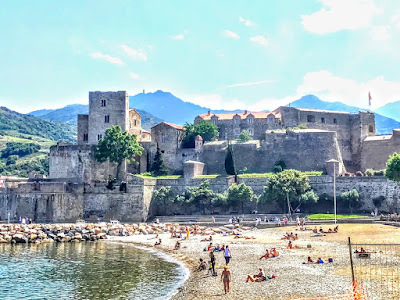 The beach is rocky but has some sand, and after visiting the Church of Notre-Dame-des-Anges with its converted lighthouse, we walked across to the small island of Saint Vincent, with its small chapel and views back across the harbour to the castle and Collioure. According to legend, this is where Saint Vincent was martyred in 303. The chapel was built in 1701 for the arrival of new relics of the saint. 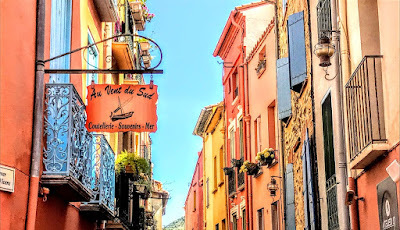 Before we left, we lingered for a little while over wine and coffee by the harbour, enjoying the mid-May sunshine and the pastel colours of Collioure. Oh gentle God, You cross all the barriers of separation; longing to be near us, you wipe away our tears, you shower us with precious gifts; your comfort soothes away our shame. May we spread the word that you have spread a table – and that all are welcome at your feast.